An absolute must have item in any maternity wardrobe’s collection. The little singlet style top has adjustable straps and drop down clips at the front for breastfeeding. An absolute must have item in any maternity wardrobe’s collection. The little singlet style top has adjustable straps and drop down clips at the front for breastfeeding. It is by Maternity Plus. There is a discreet opening so you don’t have to expose the breast. Also plenty of the stretch in the soft cotton elastane fabric, allowing it to be during pregnancy as well. 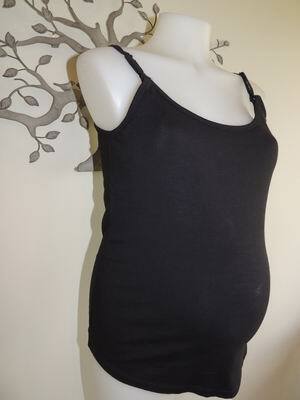 Be the first to review “NEW Black Cotton Lycra Feeding Maternity Singlet” Click here to cancel reply.